Monsters roam through Arcopolis, swallowing children into the horrors of their shadowy underworld. Only one man is a match for them – the genius vigilante Haggard West. IT’S TIME TO MEET AN ELECTRIFYING NEW HERO. Before getting into the story it’s important to know two things: Battling Boy is written for teenagers, and it’s the first of two parts. Keeping those two facts in the back of your mind will allow you to fully appreciate and enjoy this work. Two tales are presented, woven together at the end of this volume. We have Haggard West, inventor and protector of Arcopolis, who is slain and mourned by his daughter Aurora. 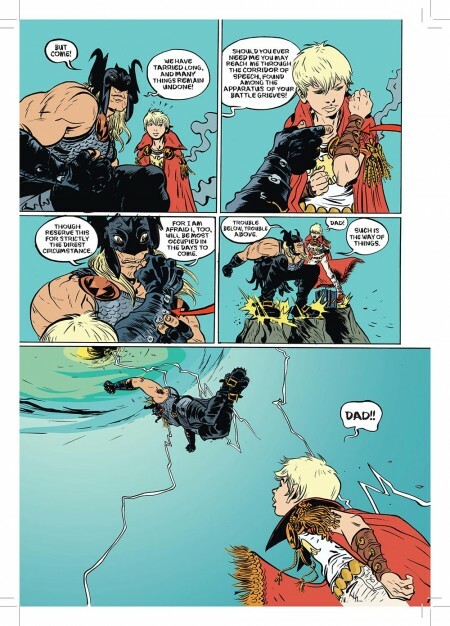 Battling Boy is a god on the eve of turning from child to manhood, and thus go a-rambling to prove himself. His father picks Arcopolis as the spot and drops him off there with a suitcase and a cloak. Aurora picks up her father’s mantle, along with his dizzying array of gadgets, and heads out to stop the evil that killed her father. 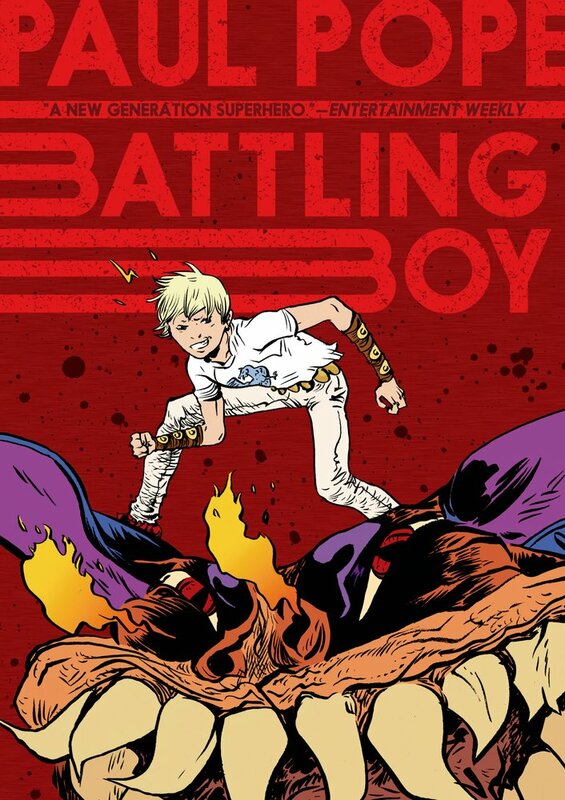 Battling Boy begins his work by trying to clear out the monsters from Arcopolis but gets sucked into municipal politics until the two young heroes join forces to defeat the common enemy. Pope is careful not to have any names used throughout the entire scene at the unnamed floating city that these gods live in: son, father, wife, brother, master cook, anything but a name. This allows for the dramatic reveal of our hero as Battling Boy when he assists Arcopolis, taking a queue from his father as seen below. 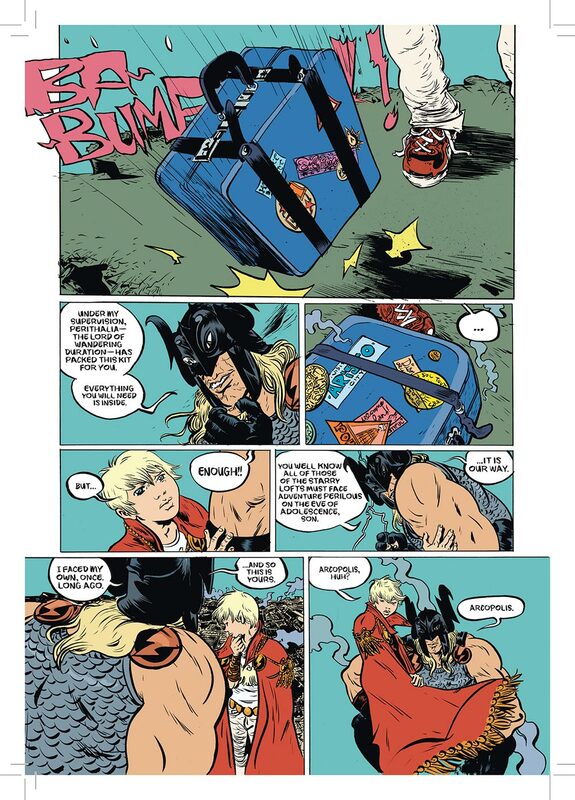 Aurora and Battling Boy are perfect characters for the target audience: young, inexperienced, being thrust into a world of adults without a clue how to proceed. The characters are wonderfully diverse and all over the place, fleshed out quickly and skillfully as they’re encountered and interact with our heroes. I especially appreciated Pope’s characterization of the villains in their black hooded outfits and diabolical intent. Pope handles pencils, inks and lettering throughout and it’s a strong visual presence. There is no mistaking the artwork for anyone but Paul Pope, with its thick blacks, intense facial expressions and larger than life characters, locations and scenarios. Hilary Sycamore provides colours that pop through a matte palette. Overall design is rich in texture, depth and presentation. But most of all it’s over the top exaggeration. The villains aren’t just wearing a white body suit under their black ropes, they’re wearing elaborately wrapped bandages. Battling Boy’s first monster doesn’t just have fangs, it has a mouth full or twisting oversized teeth. Great stuff. 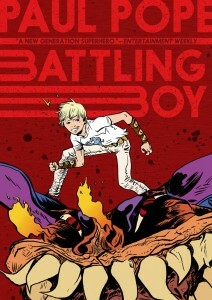 First Second presents Battling Boy in hardcover, softcover and Kindle to appeal to the widest buying audience possible. I received the softcover for review and it contains no extras, bio or notes. From what I’ve seen online the hardcover has a bio of Pope on the dust jacket foldover. I would have loved something at the beginning to let me know this is the first of two parts, as the story just ends. It’s a decent cut point but only if you know something else is coming. I found that tidbit out along with the sample images from an EW article. 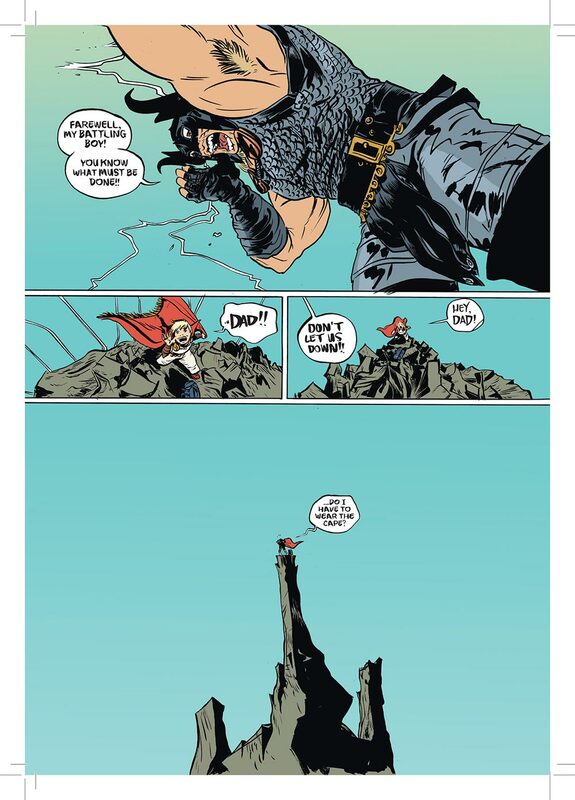 Battling Boy hits its target audience straight on with a strong story, compelling characters and richly detailed artwork.